This kit gives you a noninvasive, instant face lift. This was the first item in Lea Black's skincare line over twenty years ago and is still one of their best selling products. I love how you mix the Facial Contour Lift Gel and Facial Contour Lift Powder to create the mask yourself. The mask helps to reduce the signs of aging, minimize enlarged pores, and to treat blemishes, among other benefits. After leaving this on for twenty minutes you (or the lucky person you gifted this to) will have firmer, lifted, tightened, and more toned skin. This is hands down my favorite product in the Lea Black Beauty line and you can read my full review on it here. This is a combination product that contains both chemical and physical exfoliants to help give you the best exfoliation possible. The chemical exfoliant in this product is lactic acid, which is often praised for it's ability to effectively exfoliate skin without causing irritation and tiny beads are used as the physical exfoliant, which will help to gently remove dead skin cells. Other ingredients include a natural extract complex of Aloe Vera, Grapefruit, Licorice, Cucumber, Green and White Tea, essential oils, Sunflower, Jojoba, Vitamin E, and Hyaluronic Acid. All the ingredients come together to not only exfoliate, but to encourage cell regeneration, remove impurities, and refine skin's texture to reveal skin's natural radiance. This rich cream is my second favorite product in the line and you can read my full review on it here. This luxe facial cream features a concentrated formula that is an ultra-rich, anti-aging, antioxidant moisturizing, and hydrating. It advances skin's water retention abilities, deeply hydrates, smooths wrinkles, plumps skin, and improves firmness. It is so powerful that in just two days it increases skin moisturization by 500%. This serum is meant to be used in conjunction with the Intensive Moisture Renewal Créme or Everyday Moisture Lotion Face and Hydrating Eye Créme. With just a few drops (a little goes a long way with this!) applied to skin this works to strengthen, renew, and revitalize skin. It features "a proprietary blend of fruit extracts that enables higher performance from the retinol without the irritation," and boosts the formation of collagen fibers. Apply this under either of the aforementioned moisturizers for radiant skin. The mild facial cleanser contains real pearl extracts and marine minerals to help to gently exfoliate skin without drying it out. It also contains a powerful anti-aging complex with ingredients such as vitamin C and grape seed oil. This can be used both morning and night to gently cleanse your skin and reveal clean, moisturized, soft, and brightened skin. This is a lightweight hydrating lotion that is easily absorbed by the skin. It is "is infused with a natural extract complex made up of Aloe Vera, Grapefruit, Licorice, Cucumber, Green Tea and infused with Vitamin A and E, Mango Seed, Cocoa and Shea Butters and a-Lipoic and Hyaluronic Acid." These ingredients work to fight the visible signs of aging, promote firmness, and moisturize. Using this will leave your skin hydrated, soft, and glowy! *I was given these Lea Black Beauty Products by Lea Black to facilitate my post, however opinions of these products are all my own. Thank you for supporting the brands that support The Blush Blonde! I got a deluxe sample of this in my October PLAY! by Sephora box and am totally loving it. I've talked about my love of facial mists and this spray on here countless times so it's not really surprising that I'm loving this new one. This spray contains glycerin to moisturize skin, essential oils to energize, Horsetail juice that contains vitamin C and antioxidants, and Echinacea GreenEnvy™, which inhibits enzymes that breakdown collagen. I like to spritz this on before applying a moisturizer to really lock in its benefits. I have talked about these pads so many times because they are so amazing. They literally make my skin glow and I can see a huge difference in my skin if I forget to use them one night. These pads use lactic and glycolic acids to gently exfoliate, and lemon peel and licorice root to brighten skin. If you only try one beauty product from my blog this is the one you need to get! I'm a big fan of BB and CC creams because they combine makeup and skincare. I'm a skincare fanatic and do not like to wear a ton of makeup, which makes BB and CC creams perfect for me. I had been using this BB Water, but was not happy with the results so I decided to try the It Cosmetics CC Cream after hearing so many wonderful reviews. I am so glad I gave this a try because I love how it works. It covers up any skin issues while still looking natural and a little goes a long way. Another bonus is the smell, it has a citrusy scent to it, which I love! I talked about this last week in a post that I did about my nighttime beauty routine. This oil is a retinoid oil that moisturizes, shrinks pores, reduces wrinkles, calms redness, and improves skin smoothness. I've noticed a huge difference in my skin since I started using it and I recommend checking it out (Pro Tip: Go to Sephora and ask for a sample of it!). I discussed this in the same post as the Luna Sleeping Oil. This is a pharmaceutical-grade, lactic-acid-based treatment that works to exfoliate, plump fine lines, reduce hyperpigmentation, increase circulation, and firm skin for instant radiance. I layer Good Genes on top of the Luna Sleeping Oil for seriously amazing skin. I also love how this works with the previously mentioned facial pads to give me glowing, blemish free skin. It is very important to not brush your wet hair because wet hair is more elastic and prone to breakage then dry hair is. The Wet Brush has super flexible bristle that are gentle on hair and make it the perfect tool to brush through wet hair. I've had mine for a couple of months now and love it so much that I've got my Mom and sister hooked on them too! This is something that is important for everyone to use in order to keep hair healthy and prevent breakage. I got this as a deluxe size sample from a Sephora Beauty Rewards kit and had great results from it. I am big on micellar water, especially in the morning to wash my face, and I typically use this one, but now I am loving the more luxe version that Caudalíe makes. I like this one so much though that I just ordered a full size bottle of it yesterday! My hair can be a little tricky to take care of because of its color. I've never dyed my hair before and my hair tends to hold the color of anything that touches it (like mascara and face paint). I usually like shampoos formulated for blondes because they help to keep the color of my hair natural and care for its special needs. Recently I've loved the cool blonde hair color that has been all the rage and was very excited when I came across this shampoo, it's a violet shampoo that works to reduce brassiness and neutralize yellow tones in all hair colors. I've used this a few times and am hooked. I will admit that it can be a little on the drying side, but I've been using my #10 must have to help with that. My best friend sent me an article from InStyle about this mascara and how amazing it is. In the article it explained that it is so popular that some Sephora's have trouble keeping it in stock. After reading all about it I knew I had to try this mascara and am so glad I did! It does an amazing job on my lashes, it makes them longer and more volumized, but it never clumps. I'm still only on my first tube of this, but I plan on purchasing it again in the future. I did this post on this hair masque a while back. It is a really thick mask (which I love!) that brings your hair back to life and really moisturizes it. Like I explained my previous post it is rich in rice amino acids that replicate the keratin structure of human hair. It works to seal cuticles, repair damage, balance pH, and restore resilience. It also smoothes hair and helps to make it more manageable. It works to strengthen hair from the inside out and since it doesn't contain harsh ingredients it is safe for everyday use. What are your must haves this month? The holiday season is officially in full swing, which means there are lots of holiday parties taking place. My Mom always taught me that when you attend a party bringing a gift to the hostess to show your appreciation is a must. To help you out I've round up thirteen gifts at three different price points (under $10, under $25, and under $50) that any hostess would be thrilled to receive. I personally prefer to bring an actual present instead of a bottle of wine because everyone brings a bottle of wine and I like to be different and give something that can be used multiple times. Any of these luxe gifts are sure to be appreciated by your hostess and you might be lucky enough to get an amazing gift the next time they come to visit you! While I like everything pictured here my number one favorite is this candle, it smells amazing and lasts a long time, making it the perfect gift! What is your favorite thing to give as a hostess gift? Today I'm linking up with Hello Monday, Let It Shine, Weekending, and MIMM. Last week I shared my Beauty Guru Gift Guide and today I'm sharing a guide with the perfect gifts for the fashionista in your life! I've got everything from stocking stuffers like this passport holder to bigger ticket items like this bag and these gorgeous sunnies. There are so many adorable things on this list and I would love to have all of them in my closet! I think that this hat is just adorable and I've been wanting a necklace just like this one. 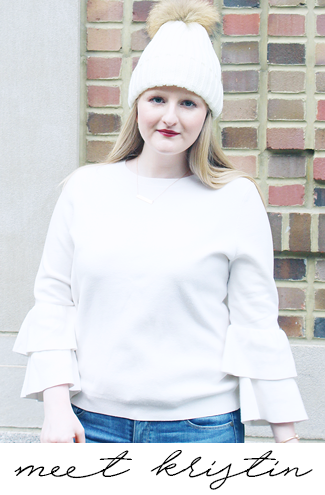 I personally always love shopping for fashion girls because I find them to be easy to buy for, my advice is to head to Nordstrom and/or Shopbop for tons of great presents. Hopefully this gift guide can help you out with all the fashionistas you need to buy gifts for, especially during Black Friday and Cyber Monday! Are you heading out for Black Friday this year or do you like Cyber Monday better? CLEANSE: If I am wearing makeup I take it off before cleansing with makeup removing wipes. This cleanser has become my go to for my seriously dry skin (especially in the fall and winter). It keeps my skin hydrated while effectively removing dirt and oil from my face. I use it every night with this Clarisonic and have seen great results. Using these two in combination has left my skin clear and has prevented dry flaky skin. TONE: I use witch hazel for a few reasons at night. First, I don't wash my hair every day so after cleansing I put some on a cotton pad and use it to clean my hairline so that it doesn't breakout, this also removes any cleanser residue that might've been left behind. Second, I use it to clean my neck because I hate washing my neck with cleanser (I always land up covered in water) so I use this instead to prep for exfoliation and moisturizer. EXFOLIATE: I honestly have to say that these are my #1 holy grail product and have been for the last few months. I've posted on them a few times before, which shows you just how much I love them. I use them after cleansing and take one pad to wipe all over my face and neck. I actually didn't use these on Sunday night and when I woke up yesterday I noticed a huge difference in my skin - it was dull and had more texture than usual. When I use these they literally make my skin glow and help keep to breakouts at bay. 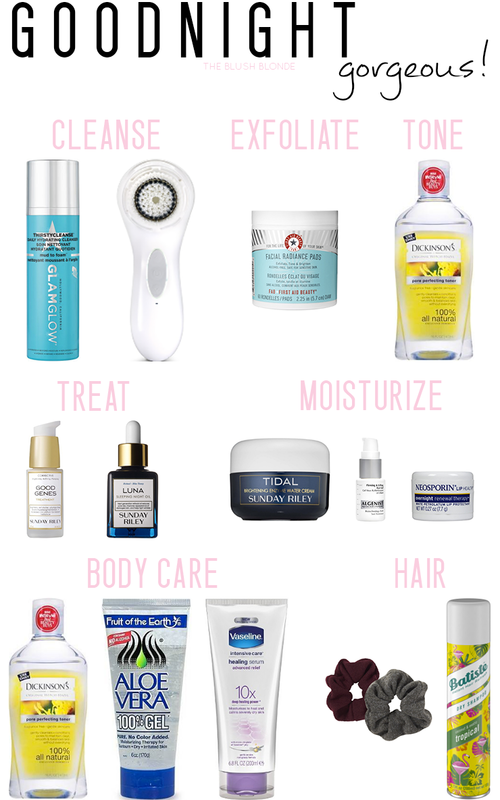 MOISTURIZE: At night there are a few important places that need to be moisturized. I recently started using this facial cream and I absolutely love it. This is the cream I mentioned above and it works wonderfully with the Luna Oil and Good Genes. It contains two types of hyaluronic acid to drench the skin in water and moisture, it also contains papaya enzymes, which smoothes and exfoliates. (Pro Tip: If you're interested in trying the cream, Luna Oil, and Good genes buy this kit!) After this I put on eye cream, I have been using this one lately and really like it because it is very hydrating without clogging pores. Lastly, I have super dry lips (that frequently crack and bleed) and this lip balm is the only thing that soothes them and I have been using it for years! BODY CARE: My chest tends to break out so every night I clean it with witch hazel on a pad and then apply aloe vera to moisturize the skin without clogging pores (for more info on this check out this post). I then apply body lotion all over to help with the dry skin on my body. Currently I'm using this moisturizer because I read an article about it in Allure where they raved about it and I like the results I've seen. HAIR: To keep my hair from looking greasy I use this dry shampoo. The Tropical scent smells really good and it makes my hair feel clean on days when I don't wash my hair. Applying dry shampoo at night allows it to better soak into your hair and absorb oils. Last, but not least, I put my hair up with a scrunchie to prevent an indent a regular hair tie would cause. I keep my hair up while I sleep to keep it out of my face and preserve a blowout. What is your nighttime routine like? Are you more of a morning person or a night owl like me? Can anyone else not believe that it's already time to start buying holiday gifts? It feels like 2016 has just flown by and it's crazy to think that in a little more than five weeks we will be celebrating Christmas and Hanukkah! I like to get my shopping done early so I wanted to start sharing Gift Guides now in case some of you are early shoppers too. Keep your eyes out for a few more of these in the days and weeks to come! This gift guide is for the beauty girl in your life. Does your Mom, Grandma, sister, or best friend love everything beauty and is your personal beauty guru? If so this is definitely the list for them! As a major beauty girl myself I had so much fun putting this guide together and I know it's filled with products that my fellow beauty addicts will love. The great thing about this is that every item rings in at under $80 with most gifts being under $50 and a even a few that cost less than $20! From splurge items like this set from GLAMGLOW (which I happen to own and love) to fun (and inexpensive) stocking stuffers like this and this I've got you covered. I am really loving all of the gifts here and hopefully this guide can help you with some of your holiday shopping. I usually try to have my shopping done before Thanksgiving, but I think that this year I am going to hold out and wait for Small Business Saturday and Cyber Monday. What are your shopping plans for Christmas this year? Do you like to get it done ahead of time or wait for the Black Friday and Cyber Monday deals? Let me know below!